I have included a list of names on the BWMP page. 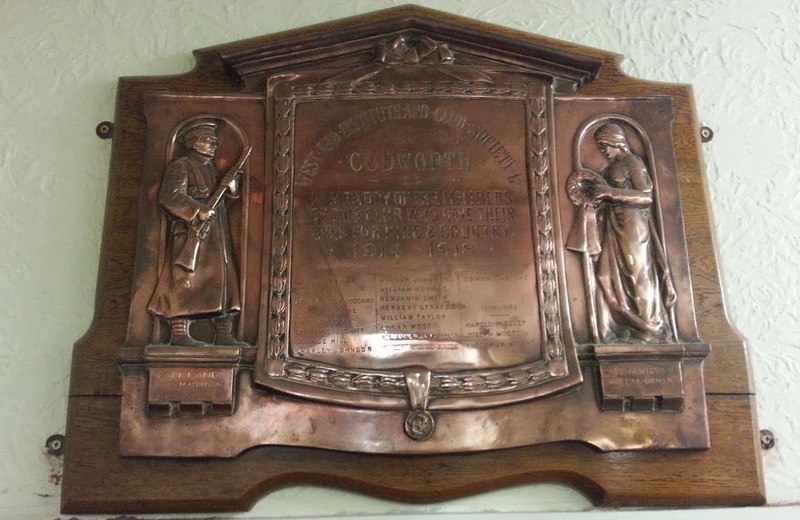 It wasn't very easy to get a good photo of the plaque - it's very high up on the wall of the club's entrance hall. I think we might need to get permission to go back with a step ladder! Yesterday's notes from the first six months of the digitised Barnsley Chronicle for 1923 include the beginnings of a discussion at the Grammar School about an Old Boys' Memorial. This will be the one that is now in the Cooper Gallery in Barnsley. Also being discussed and much more swiftly erected and unveiled was the Sportsman's Memorial at Shaw Lane. A little bit contentious because after its unveiling and dedication there were a series of letters in the Barnsley Chronicle from various other sports clubs that felt a bit left out! The band concerts and cinema showings to raise money for the Barnsley War Memorial, the one that is now in front of the Town Hall, continued. I didn't see the results of the Silver Ballot I mentioned last time, but I'll go back and have another look after the New Year. 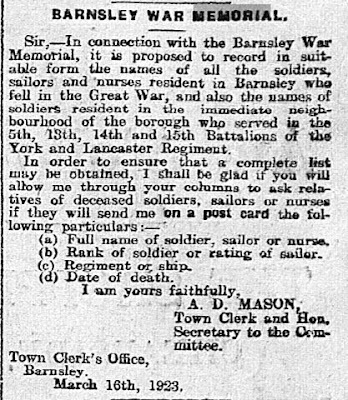 The Town Clerk publishes a letter asking for names to be submitted 'in connection with the Barnsley War Memorial'. This links back to the mention towards the end of 1922 of a plan to prepare a list of the names of the fallen men to be inscribed upon vellum. It does seem that very little happens in Barnsley without a comment of some kind in the letters column of the Chronicle! The following week a serviceman writes in asking why the list has been limited to the 'soldiers resident in the immediate neighbourhood of the borough who served in the 5th, 13th, 14th and 15th Battalions of the York and Lancaster Regiment'. Personally I was wondering why the request for names was limited to soldiers, sailors and nurses. What about airmen? or people who died as a result of enemy action? or the people driving ambulances on the front? Surely some of them were volunteers, not always soldiers or nurses? Does it include people who died from wounds after the war ended? Too specific I feel. If the Town Clerk or the Council respond to the gentleman's query I didn't see it. However I was searching using the automatic find functionality in Adobe Reader, and just looking for the word 'memorial' so it is possible that the reply was in a part of the newspaper that didn't scan very well or maybe the word memorial wasn't used in the response. Again, I must go back and look more closely at the newspapers - the old fashioned way(!) a page at a time to try to find the answer. As the list of names has not been found in the Barnsley Archives since we started this project and none of the archive staff are aware of such a list existing I do also wonder what happened to all the postcards sent in by the family and friends in response to the Town Clerk's request. Another mystery!